Here is a statement of fact – even if brownies look bad, they still taste AWESOME! I could eat them directly out of the dish with a spoon, so I really don’t care what they look like. 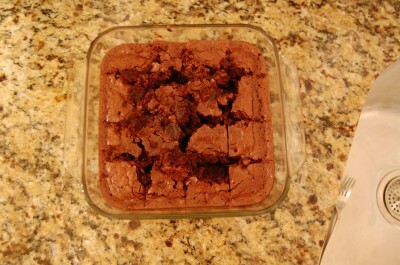 However, when you want to take a pretty plate of brownies to a potluck, you want them to look nice. You don’t want them to look like you just dug them out of the garden. The problem with the brownies on the left is that they’ve been cut with a metal knife. 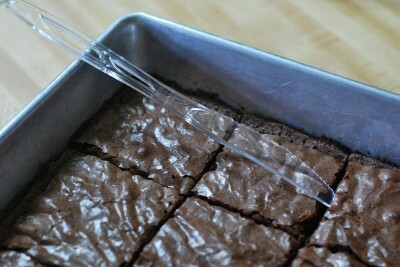 If you want nice looking brownies, cut them with a plastic knife. That’s it. Let that soak in for a minute. They won’t rip and tear if you use plastic. Your brownies will be the talk of the potluck. So, do what I do and keep your plastic knife the next time you’re at a fast-food place. Bring it home and wash it and you’ll have pretty brownies forever! Well, at least until you break that knife and have to get another one. If you’re at home, just use a spoon and eat directly from the pan. Thanks. This post is linked at Kitchen Tip Tuesday on Tammy’s Recipes. You can use floss to cut a decorated cake, it will not mess up the icing, and makes clean lines. Get a long piece of floss, pull from top to bottom of cake, then pull out through one side (what little bit of icing that gets on the floss is swiped onto the cake). You’re right – it works GREAT! I’ve always wondered how to make them cut smooth! Are those the brownies we had Saturday? They were yummy! Plus a plastic knife won’t scratch the bottom of you metal pan. I actually bought one of those Perfect Brownie pans (clearance rack at Walmart $5.99) advertised on TV and I love that thing.